Here's a retirement plan: Don't. Are you planning on retiring someday? This Financial Post article suggests you don't retire, especially at a younger age. Specifically, "Those who retired at 55 were 89% likelier to die within 10 years of retirement than those who retired at 65." Don and I don't have a "retirement" plan per se, and frankly we don't see the need for one. We have so many interests and several small income-earning streams (a little here, a little there) that we can ease out of the more physically-demanding ones and embrace the less physical options as we get older. We're also reaching the stage where our children are becoming adults and we will no longer be financially responsible for them, reducing our expeses. We also long ago embarked on the concept of reducing our expenses to meet our income, rather than raising our income to meet our expenses. And the question arises, retire from what? Country living? Not as long as we're capable of enjoying it. Writing? Not likely. Wood crafting? We might ease up on that aspect, but likely won't ever cease. Frankly, "retirement" suggests you're finally able to cease working at jobs you dislike enough to want to leave them behind and start enjoying life. We like what we're doing and therefore see no need to stop, as long as we're physically able to continue. The article states, "Pensions for workers are retrograde ideas, barely a century old in the English speaking world, that have outlived their purpose, if they ever had a valid one at all. Instead of incenting us to retire, we should be incented to keep working. We’ll live longer and better, and we’ll make the world a better place, too." Not everyone has the option to continue working in their fields. Some careers are cut short at a certain age due to safety concerns. Others (my older brother included) are laid off and unable to find another job in the same field because no one wants to pay for worth and experience and instead prefers younger (cheaper) workers. But when those factors don't come into play, continuing to work well into old age at occupations you enjoy seems like it's the best thing. My hope is I won't leave the farm until they carry me out feet-first. How about everyone else? Are you planning on retiring? Or, to change the nuance, what are your retirement plans? 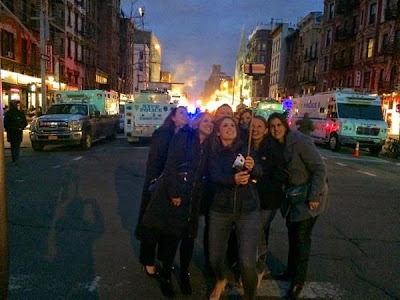 "The defining photos of the Millennials"
My husband found this appalling photo of seven women taking a "selfie" in front of an explosion and fire in Manhattan's East Village this past week. So far two people are confirmed dead from that tragic incident. Yet these giggling women are taking a selfie. They even had a "selfie stick" to assist in their memento. Little did they know they'd end up on the front cover of the New York Post. My husband saw the photo and was appalled by the implications. He called it "the defining photo of the Millennials." You know how certain events or demographics are defined by epic photos? The end of World War II saw the sailor kissing a nurse. The Vietnam War was tragically personified by the child running naked away from napalm. And here we have Millennials -- who, if this photo is anything to go by, are shaping up to be shallow, thoughtless, and oblivious to what's going on around them. Please don't think I'm condemning the entire demographic (our daughters, for example, are considered Millennials) -- it's just that this photo personifies the shallow, thoughtless, and oblivious members of the generation. 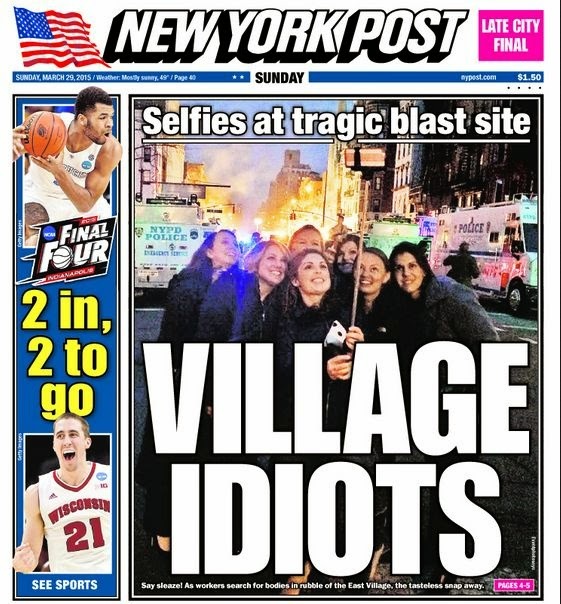 Death, destruction, and mayhem are taking place behind them... and yet these women are saying “Let’s take a selfie!” and even have a selfie-stick for that very purpose. Then they post their self-absorption on social media. Wheeee. The defining photo of the Millennials? Lord in heaven, I hope not. 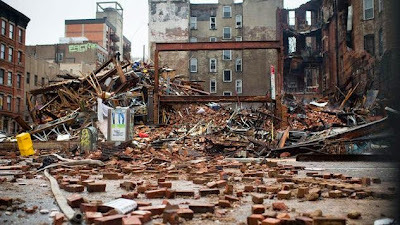 Here's my WND column for this weekend entitled California: A State of Denial. It's been awhile since I put up a collection of random pix, so here you go. In early February, a light dusting of snow covered a bench normally tucked on the porch. 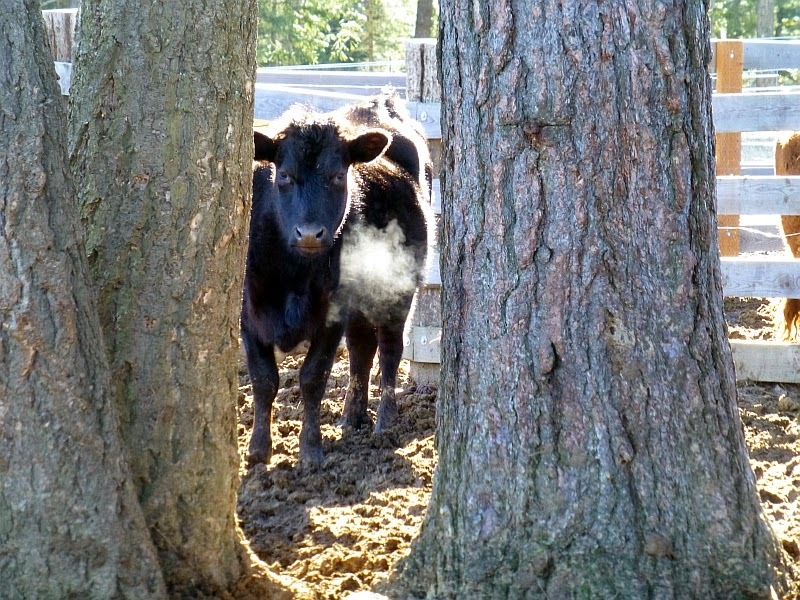 Drippings from the barn roof also created mini-icicles on some cattle panels below. Steamy breath on a frosty morning. Lydia basking in some winter sunshine. ...and later, like Lydia, basking in the winter sunshine. 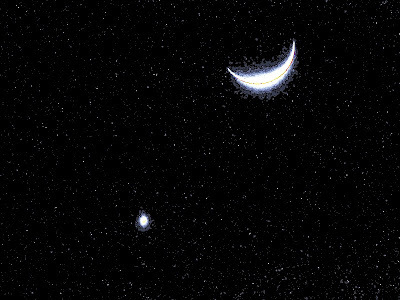 A crescent moon and planet. And just for fun, the same photo with automatic color adjustment. I was actually impressed with how many stars showed up. Maybe I should try a little more night photography. Early early dawn shadows of the house and barn, stretching westward. 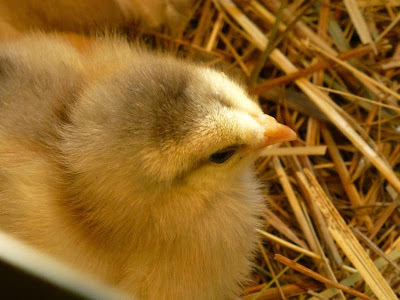 Chickens basking in the winter sunshine. Here's Sparky (black) along with her yearling calf Dusty (on the right) and this-year calf Lucy (on the left). What color calf will Sparky produce next? Lydia in a remarkably cat-like pose, with her paws tucked underneath. Ninja cuddles in the hay on a chilly morning. Chuck still sneaks drinks from a patient Polly. I think the potatoes are trying to tell us something. Remember the phrase "the grass is always greener...?" Well apparently it also means the hay is always tastier on the other side of the feed box. Sorry for all the Ninja shots, but he's so durn irresistible! Here's patient Sparky doing double-duty with this year's calf (Lucy) and last year's calf (Dusty). When the mud dried out, we put Shadow and Ninja down in the woods with the rest of the beasties so he could meet his herdmates. Even dominant cows are very respectful of a baby's youth. Always nice to see. I think I'll start keeping a "running tally" of random shots since I always seem to have some. These are from a few weeks ago when the weather was a bit cooler, and before Hector was born. Yesterday while chasing our recalcitrant calf Lucy off a neighbor's property, Don and I decided to walk the fenceline to see where she might be slipping through to the other side. This particular neighbor owns two parcels forming an L around us, so we walked along two sides of our property, looking for holes. While doing so, we came across a large stash of old lumber and rolled up used field fencing, apparently abandoned. Since this neighbor has this parcel of property for sale, we decided to call and make an offer on the abandoned materials. So Don called, and his offer was accepted immediately. To the neighbor, the abandoned materials were junk that he would just as soon get rid of before putting the parcel on the market. To us? Treasure untold. 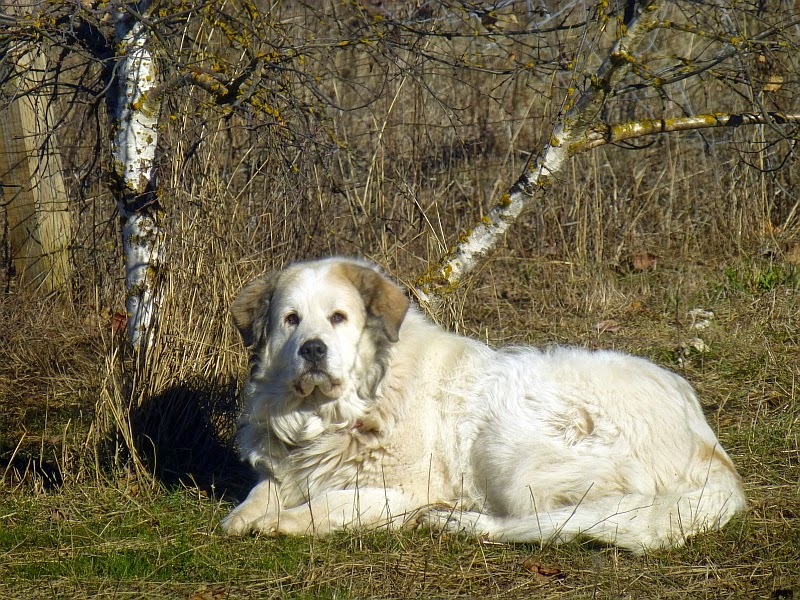 Besides... with all that field fencing, we'll be able to reinforce our property boundaries and hopefully keep Lucy where she's supposed to be (an added benefit to our neighbor!). Well, what do you know... there's Lucy again, grazing where she shouldn't be. Good thing no one around here minds her wanderings. The access road is rough and rocky, but in good shape. Don backed the little trailer up to the woodpile. Here's some of the wood -- 2x6s about 15 feet long. There were piles of plastic corrugated siding, as well as poles of all sorts -- some aluminum, some PVC, etc. It's hard to determine how much field fencing there is -- but clearly enough for generous amounts of fencing. There are stacks and stacks of miscellaneous boards, posts, and a couple of railroad ties. Sadly, much of the boards (and especially the railroad ties) are rotten beyond redemption. The 15-foot 2x6s were far too long to put on the little trailer, so Don went home and got the truck as well, which has a wood rack on top. Then we began sorting. Many of the boards were too rotten to be salvaged, and literally fell apart or crumbled when we lifted them. We saw lots of carpenter ants in the rotten parts. The salvageable boards were very heavy from water -- we'll need to stack them properly with spacers, to dry, before they can be used. We stacked the trash materials to one side for the time being (we'll remove it later and burn it). We loaded the salvageable boards onto the wood rack. We loaded smaller boards, beams, and the plastic corrugated sheeting onto the small trailer. Clearly this is someone's dismantled greenhouse from years past. The material is in superb shape -- no cracks, splits, holes, etc. ...and back up to the house, where we encountered a traffic jam, country-style. Move, Matilda! Don later went down by himself, dragged one of the larger bales of field fencing out, and strapped it to the tractor bucket. It will take us a couple of weeks, working in our spare time, to remove all the abandoned materials from this pile. But what a treasure! We're grateful it's another man's junk. Hi! I'm Rat Fink Barbie! "Take a picture! She's reading a book!" Got $300? Start a blog! Are you a parental despot?